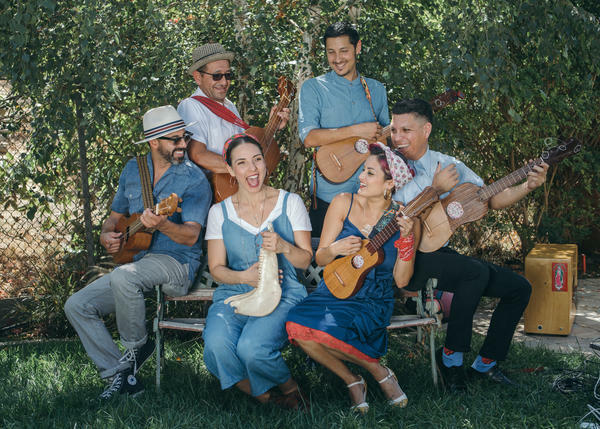 The East L.A. band Las Cafeteras is known for a version of "La Bamba" that mixes traditional Mexican son jarocho with hip-hop. Sixty years ago this month, a 17-year-old Mexican-American kid in California released a single that quickly climbed to the Top 40. In 1987, an East Los Angeles rock band added their own spin, which became the first song in Spanish to hit No. 1 in the United States. And just last fall, that same song found a new meaning on the streets of Shelbyville, Tenn., about an hour south of Nashville, as counterprotesters faced down a group of neo-Nazis and white supremacists. It had been two months since the Charlottesville "Unite The Right" rally, where Heather Heyer was killed after a car plowed into demonstrators. On this unusually cold October Saturday in Shelbyville, opposition to the event was out in force. According to news reports, counterprotesters outnumbered actual attendees of the so-called "White Lives Matter" rally by at least three to one. They carried signs with slogans "Hate Has No Home Here," and they brought a sound system so they could drown out the white supremacists with chants and music. "It was loud," says Chris Irwin, one of the organizers. "I'm afraid we may have damaged their hearing." Irwin is a lawyer in Knoxville who refers to himself as a "tree-hugging, sixth-generation East Tennessean." He's been to a lot of protests in his time, and says he recognized some of the people on the other side that day. "There's this guy we call Angry Santa. And Angry Santa is a KKK guy, unabashed," he explains. "And he starts talking about rounding up 'all you degenerate whores.' "
"A white supremacist gets up to give a speech. And he doesn't get punched — someone just starts playing 'La Bamba.' That is the greatest protest ever. These people don't deserve our anger, they deserve our ridicule." Pointing out a bobbing head in the news footage, he added, "Even one of the Nazis can't help but dance along." "Think about that," Irwin says, recalling the moment. Here was a group of white supremacists, spouting hate — and on the other side, "we had a thousand people show up. African-Americans, immigrants, Hispanics, brave people — dancing and laughing at them." As right as "La Bamba" is for these times, it's got a long history. As the story goes, 1950s rock star Ritchie Valens — that 17-year-old kid from the the San Fernando valley — probably grew up hearing the Andres Huesca version of the old Mexican folk song, which was popularized during the golden age of Mexican cinema around the 1940s.His own recording, released in 1958, was actually a B-side — but it became a surprise hit, climbing to No. 22 on the singles chart. It was the most enduring hit in a short career. Valens was just 17 years old when he died, along with Buddy Holly and J.P. "The Big Bopper" Richardson, in a plane crash in Iowa on Feb. 3, 1959. In 1987, his life and death became the subject of a film, also called La Bamba, which featured a new version of the song by Los Lobos. "If there is one song that represents the Americas, it is this one song," says Luis Valdez, the director of La Bamba. While the song is familiar to most Americans today, Valdez says the meaning of its title remains a mystery. He did lots of research for the film, and thinks it's a reference to something he calls "umbamba," from Africa. "It was a beat, it was a sound, that landed on the shores of Veracruz." Some history here: Enslaved Africans were brought hundreds of years ago to Veracruz, Mexico. Because cultural fusion has long been a means of survival, African, indigenous and Spanish traditions were mashed up as a result. Out of that mashup, a musical style was created called son jarocho. In traditional versions of "La Bamba," the instruments in son jarocho get played in a rhythm that is undeniably Afro-Carribbean. "It's, like, embedded in the strum itself," explains Alexandro Hernandez, an ethnomusicologist at UCLA. "It is that Afro-Caribbean connection that's been there for hundreds of years, mixed in with a little bit of Español and first nations." The Valens version added a modern twist. At the time the musician (whose real name was Richard Valenzuela) was growing up, segregation was still legal in parts of the U.S. and some kids were punished in public schools for speaking Spanish. But there was at least one cultural force strong enough to cross those boundaries. "Ritchie took it to a whole new level and to a whole new audience: They were teenagers," Valdez explains. "They weren't hearing Mexican folk music. They were hearing rock and roll." Of course, rock and roll itself is a mashup that, like son jarocho, has roots in slavery and colonization. The Los Lobos version of "La Bamba" created for the film starts in one style and ends in the other, drawing a line between two sounds of survival. In August 1987, it reached No.1 on the American singles chart. "My parents are big fans of Los Lobos, so I just remember hearing [that] version a lot in the car," says Leah Rose Gallegos. She's a member of a band called Las Cafeteras, also from East L.A., which is taking "La Bamba" in yet another new direction: mixing son jarocho with influences from hip-hop culture. I met up with the band at their first practice space, Gallegos' parents house in Highland Park and they played me their version. Where Ritchie Valens sang that, to dance la bamba, you need a little grace, singer Denise Carlos instead raps, "This is the rebellious la bamba, because we're Chicanos from East L.A. I don't believe in borders, I'll cross them." Carlos says son jarocho is a style of music where the lyrics are always changing — like freestyling in hip-hop — and so "La Bamba" is constantly evolving. Those lyrics, she explains, represent how she and her band are feeling in America right now. "I will never be authentic to Mexico. I will never be authentic to this idea of Americanism. But I still belong," she says. "I still am valid. Our culture, as Chicanos or pochas, is valid." Bandmate Hector Flores agrees: "We're not from Veracruz — we're from right here. We L.A. kids. We speak Spanish just as bad as we speak English. And that allowed us to be proud of 'La Bamba.' "
The song follows the band everywhere — even on vacation. Gallegos says she was traveling in Thailand with her husband, who's also a member of the group, and they were invited to a karaoke birthday party. Everyone knew they were American, so they got two requests from the crowd: "Do an Elvis song and do 'La Bamba.' And we're like. 'OK, let's do it!' "
"People all over the world, when they think U.S. culture, and they're like, 'Yeah, "La Bamba" is part of that'? That's so dope to me," Flores says. "This song survived slavery, colonialism and you're damn sure it's going to survive Trump, because it lives within us. And we invite everybody to also make it yours." "La Bamba." It was the first song in Spanish to hit No. 1 in the United States. But not this Ritchie Valens version. No, the year was 1987, and the band that took "La Bamba" to the top of the charts was Los Lobos. MERAJI: For our series American Anthem, I'm going to spend the next few minutes talking about why this Spanish language song with roots in Veracruz, Mexico, is still an enduring American anthem. We'll begin in the present or, at least, the not-too-distant past. MERAJI: On an unusually cold and overcast Saturday in October last year, counterprotesters faced down neo-Nazis and white supremacists in Shelbyville, Tenn., and the counterprotesters brought a sound system. CHRIS IRWIN: And it was a nice one. It was loud. I'm afraid we may have damaged their hearing. MERAJI: Chris Irwin was one of the organizers. He's a public defender in Knoxville and says they used that sound system to drown out the speakers on the other side of the street with music. TREVOR NOAH: The absolute best counterprotest I have ever seen. MERAJI: Trevor Noah saw a video of the rally online and talked about it on "The Daily Show." NOAH: A white supremacist gets up to give a speech, and he doesn't get punched. Someone just starts playing "La Bamba." IRWIN: People were dancing on our side. And think about that. At Charlottesville, they murdered that woman with a car. They were violent. They came in with clubs and fire. And we had a thousand people show up - African-Americans, immigrants, Hispanics, brave people. And they're dancing and laughing at them. NOAH: Even one of the Nazis can't help but dance along. Look at him. NOAH: That guy totally forgets he's wearing a Nazi helmet. Yeah. He's like, yeah. We're the supreme race, but that is the supreme beat. Come on. IRWIN: And he was dancing at a Nazi rally with KKK members to a song that was multicultural by its very nature and sound and beat. And when you hit a song and something like that happens, you know on a cellular level this is something that's right for right now. This is it. MERAJI: As right as "La Bamba" is for these times, it's got a long, long history. MERAJI: Story goes that a 17-year-old Mexican-American kid from the San Fernando Valley named Ritchie Valens probably heard this version of "La Bamba" growing up, sung by Andres Huesca. It was popularized during the Golden Age of Mexican cinema, around the 1940s. LUIS VALDEZ: If there's any one song that represents the Americas, it is this one song, "La Bamba." MERAJI: Luis Valdez wrote and directed the 1987 film "La Bamba" about the life and death of Ritchie Valens. Valdez still doesn't know the exact meaning of the title of Valens' most famous song, but he did lots of research for the film and thinks it's a reference to something he calls umbamba from Africa. VALDEZ: And it was a beat. It was a sound, and that landed on the shores of Veracruz. MERAJI: Enslaved Africans were brought a few hundred years ago to Veracruz, Mexico. And because cultural fusion has long been a means of survival, African, indigenous and Spanish traditions were all mashed up. And out of that mashup, a musical style was created called son jarocho. "La Bamba" is a son jarocho song. ALEXANDRO HERNANDEZ: This strum to "La Bamba." MERAJI: Alexandro Hernandez is an ethnomusicologist at UCLA and a musician himself. HERNANDEZ: Listen to it when I mute it. MERAJI: Hernandez says that rhythm is the beating heart of son jarocho. HERNANDEZ: ...Because it is that Afro-Caribbean connection that's been there for hundreds of years mixed in with a little bit of the Espanol and first nations. MERAJI: Ritchie Valens took that style of folk music from Latin America and turned it into an anthem for the United States of America. His real name was Richard Valenzuela. He came of age when segregation was still legal in parts of the U.S., and kids were punished in school for speaking Spanish. MERAJI: Valens' version of "La Bamba" was actually a B-side, but it became a surprise hit, climbing to No. 22 on the charts in 1959. Luis Valdez says Valens took that song to a whole new level. VALDEZ: And to a whole new audience because that audience was young at that time. They were teenagers, and they were hearing rock 'n' roll. They weren't hearing Mexican folk music. They were hearing rock 'n' roll. MERAJI: Rock 'n' roll, a unique musical mashup that, like son jarocho, also has roots in slavery and colonization, a sound of survival now totally synonymous with the USA. And Luis Valdez's film "La Bamba" brought that song to new audiences three decades later using a version by a band from East Los Angeles called Los Lobos. MERAJI: The Los Lobos version of "La Bamba" topped the charts by starting with rock 'n' roll and ending with son jarocho. LEAH ROSE GALLEGOS: My parents are big fans of Los Lobos, so I just remember hearing the Los Lobos version a lot in the car. MERAJI: Leah Rose Gallegos is a member of a band from Northeast LA called Las Cafeteras. And they've come to represent "La Bamba's" future, taking the song in a new direction, mixing son jarocho with influences from hip-hop culture. I met up with the band at their first practice space, Gallegos' parents' house in Highland Park, where they played me their version. DENISE CARLOS: (Singing in Spanish). MERAJI: Now, Ritchie Valens sang that to dance "La Bamba," you need a little grace. Denise Carlos sings, "this is the rebellious "La Bamba" because we're Chicanos from East LA. I don't believe in borders. I cross them." Carlos says son jarocho's a style of music where the lyrics are always changing. That's encouraged. It's like free-styling and hip-hop. So "La Bamba" is constantly evolving. She and bandmate Hector Flores say their lyrics to the song represent how they're feeling right now. CARLOS: I will never be authentic to Mexico. I will never be authentic to this idea of Americanism. But I still belong, and I still am valid. And our culture as Chicanos and pochas is still valid. HECTOR FLORES: We're not from Veracruz. We're from right here. We LA kids, and we speak Spanish just as bad as we speak English, you know? Like - and, like, that allowed us to then be proud of "La Bamba" versus, oh, that's just how they box me up. MERAJI: And "La Bamba" follows them everywhere, on vacation, even. Leah Rose Gallegos says she was traveling in Thailand with her husband, who's also a member of the group. And they were invited to a karaoke birthday party. Everyone there knew they were American, and everyone had two requests. GALLEGOS: Do an Elvis song and do "La Bamba." GALLEGOS: And we're like, OK. Let's do it. MERAJI: Bandmate Hector Flores says he loves that story because it's just one example of how people around the world think a Spanish language song made famous by Chicanos is an all-American anthem, especially right now. FLORES: You know? And, like, that's so dope to me. This song survived slavery, colonialism. And you're damn sure it's going to survive Trump because it lives within us. And we invite everybody to also make it yours. LAS CAFETERAS: (Singing in Spanish). Transcript provided by NPR, Copyright NPR.